MANILA, Philippines - A teary-eyed but jubilant Poe has greeted the public this afternoon (November 17) after the Senate Electoral Tribunal (SET) dumped the disqualification case filed against her by Rizalino David, a defeated senatorial candidate last 2013 election. 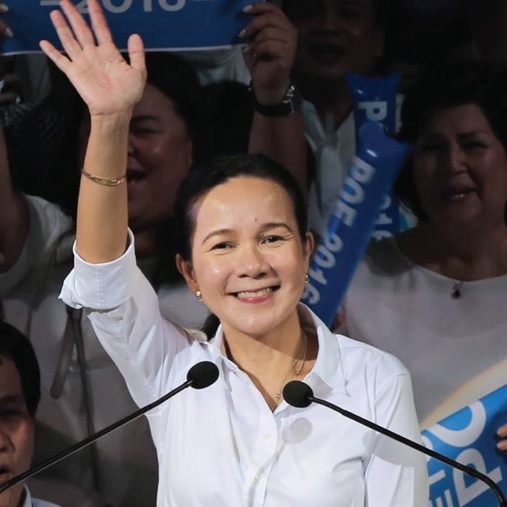 With a 5-4 result upholding Poe’s status as a natural-born citizen, it seems like the road to the presidency for the lady in white of the senate will be smoother. Senator Grace Poe during her announcement for her presidential run in 2016. The SET is composed of three (3) Supreme Court justices and six (6) senators in which Senators Benigno ‘Bam’ Aquino IV, Pia Cayetano, Loren Legarda, Tito Sotto and Cynthia Villar upheld the right of Poe to be recognized as a Filipino despite being a foundling. On the other hand, only one senator among the group voted the other way around. Senator Nancy Binay, daughter of another presidential aspirant Vice President Jejomar Binay was with the rest of associate jsutices Arturo Brion and Teresita Leonardo-de Castro together with Senior Justice Antonio Carpio who opposed the group. Prior to the ruling of SET on her disqualification case, Poe was already teary-eyed when she faced some of her supporters on her visit in Calamba City in Laguna earlier this afternoon. She admitted that she really is highly strung on the impending decision of the tribunal regarding with her disqualification case. In an earlier interview by the media with Rizalino David who filed the disqualification case against Poe, he said that he is filing the case on the grounds that the senator failed to meet the required residency period as stipulated by the 1987 constitution. According to Poe’s camp, it is not only a personal matter for Poe to resolve her citizenship issue as the senator and her team wants to highlight the importance of the status of adopted foundlings in the Philippines an issue of concern. A smoother road to Malacañan? Although the SET has spoken, it may not be over for Poe’s detractors as there’s still a possibility to take the case to the Supreme Court. Nonetheless, this victory means a lot for Poe’s campaign. Knowing how Philippine politics works, framing of issues has been very effective and this victory of Poe’s disqualification can become an additional fuel to boost Poe’s charisma with the masses, an attribute she inherited from her late father and king of Philippine movies, FPJ himself. Now that Poe was able to conquer a major issue on her presidential ambition, expect some changes in the ratings game. Her victory will be decided by the pulse of the people in the coming months as her journey to Malacañan intensifies.